Yet another procedure on Greg Oden's 90-year-old knees, but this one has a surprise twist. Oden last played in an NBA game on Dec. 5, 2009, in which he suffered a fractured left patella. It ended his season, but proved to be a symptom rather than a cause. He missed the entire next season after undergoing microfracture surgery on that left knee, but the Blazers were hopeful he might return sometime during this lockout-shortened season. That was until a setback in December. Oden had been making progress in his rehabilitation, and was feeling no pain, but doctors discovered an "issue" with a ligament in that left knee. Any optimism that we might see Oden in 2011-2012 seemed gone. Oden's undergoing arthroscopic surgery today, and here's the twist we told you about: it's his right knee that's being opened, not the one that's given him trouble for the past few years. The right knee hasn't bothered Oden since he had microfracture surgery on it in 2007, but during a routine MRI, doctors found some debris in there that they'd like to clean up. 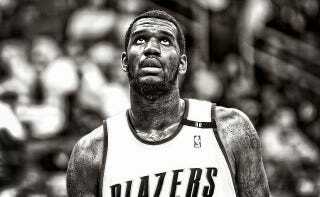 "It's too early to say" whether this will end Oden's season, according to GM Chad Buchanan, but yes, it will. Oh, and while they've got the scalpels out, doctors may decide to go ahead and fix that left knee as well.